Part of caring for a bird feeding station is preparing for the inevitable onslaught of squirrels that always seem to find a path to the seed. The Lloyd Center is no exception with a sometimes constant convoy of Grey Squirrels (Sciurus carolinensis) jumping from tree to feeder, or gracefully walking the wire to reach a quick meal. While far less problematic since they remain at ground level, are their relative, the smaller Red Squirrel (Tamiasciurus hudsonicus), which also shares this niche, and which, for whatever reason, is appearing at our feeders with increasing frequency. While not quite as entertaining as the large colony of Eastern Chipmunks (Tamias striatus) with its intricate underground system of tunnels all leading to the feeders while causing minimal disturbance to the birds, the squirrels are also part of the feeder community and forest ecosystem in general. 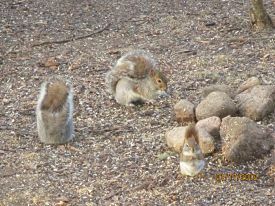 The squirrels oftentimes can be seen munching away below the feeders minding their own business. Both squirrels are arboreal, forest-dwelling mammals, eating a variety of seeds and fruits, nesting in either cavities or crooks in trees built with leaves and sticks, and have two litters per year. 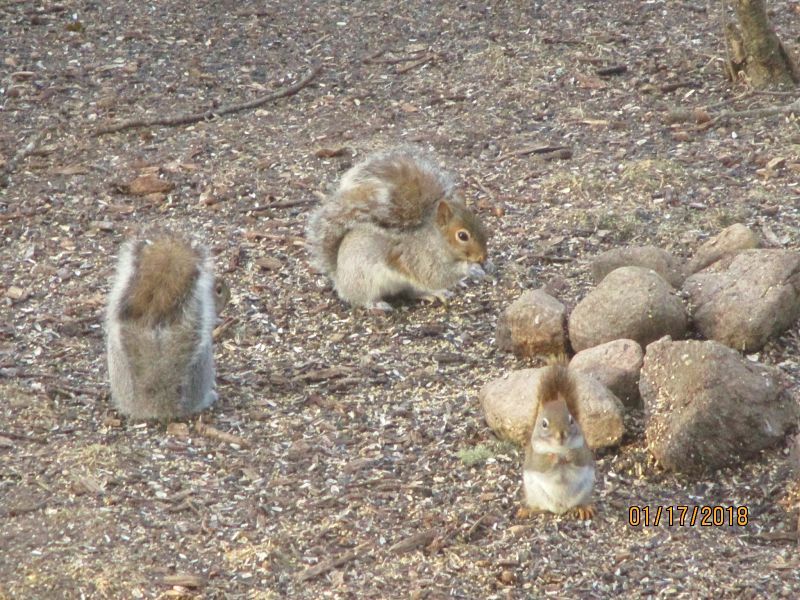 Other than appearance, what differentiates the larger bushy-tailed grey from the small, short-tailed red? The Grey Squirrel has a longevity in captivity of about 15 years, is a more southerly ranging species most common in hardwood, broadleaf woods with nut trees (such as our hickory), often near river bottoms. They are well adapted to cities, parks, and towns and were originally introduced to such areas by humans. They store seeds such as acorns singly. In some areas, the Grey Squirrel is an important small game animal, as well as being an important reforestation agent, due to storing seeds in the ground which often are never recovered. While harassing our feeders to no end, little damage is done to crops by the species. Greys mate in January – February, and July in the northern parts of its range (our region). The Red squirrel has a more northerly range and is more common in pine or spruce forests, or mixed woods, anywhere pine cones are present. They live on average 10 years. They are diurnal like greys, but will also venture out at night. As any intruder visiting the north woods who has been “bombed” by pinecones by a Red Squirrel has learned, they cache food, or gather and store it in bunches. While both species can burrow into snow, red squirrels tunnel through it, perhaps an adaptation for harsher northern climates. Reds mate in February – March then June-July. They are too small to serve as a game species, but small enough to get inside the walls of your home! While a pleasure to woodland campers, small cabins suffer damage from this species. If you like squirrels, stop by the Lloyd Center, we got ’em!